What can we learn from a wild little specialty crop market rally (lentils)? The lentil market is booming! For now…. Lentils are a popular pulse crop raised primarily in northwest North Dakota, northeast Montana, and the Canadian prairies. Due to a drought in India, prices have spiked to all-time highs. For the past few years, lentils have traded in a $.18-.23 range (per pound). The most recent price I was quoted was $.39/lb. (USD). Update: I’ve heard rumors of $.50/lb. being paid for lentils in the US. 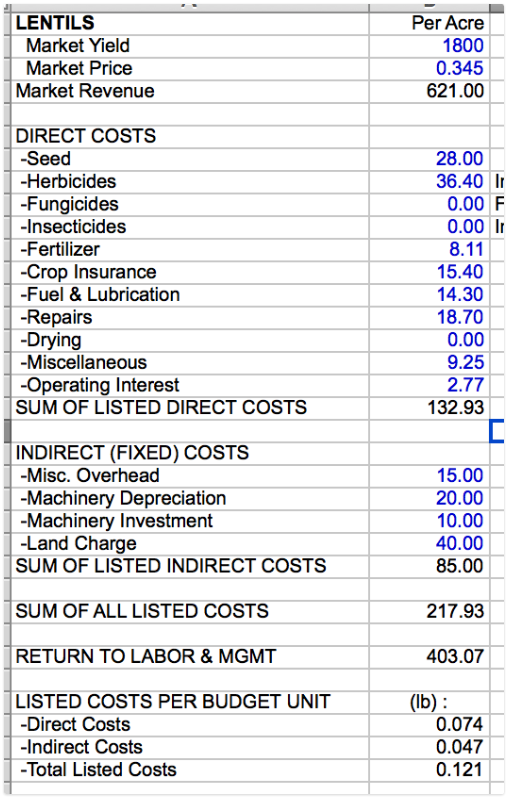 While not quite as profitable as $20+ spring wheat was in 2008, $.50 lentils are more profitable than $7+ corn was in 2012 (on a percent ROI basis). There are a lot of similarities to the corn/soybean/wheat rallies experienced from 2010-2012. I realize it’s easy to criticize and second-guess other peoples’ decisions when looking from the outside in. 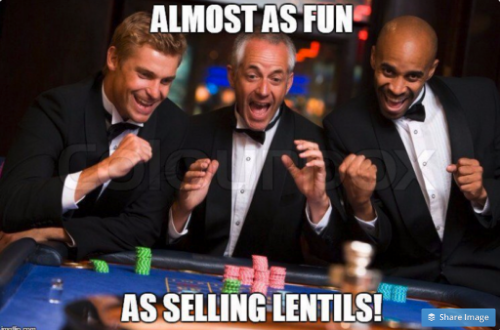 Even though 99% of you don’t and likely can’t raise lentils, I think it will be a valuable lesson to follow the lentil market over the next 12 months to see how it all plays out. I’ve spoken with a few ND lentil producers recently and the average yields on their farms this year was approximately 1,800 lbs./acre (10-20% above avg). While a few of the farmers were completely sold out, there are a number who have sizable amounts of production left to sell. Lets assume a producer sold 50% of their crop for $.30 with the market currently bidding $.39 for the remaining 50%. 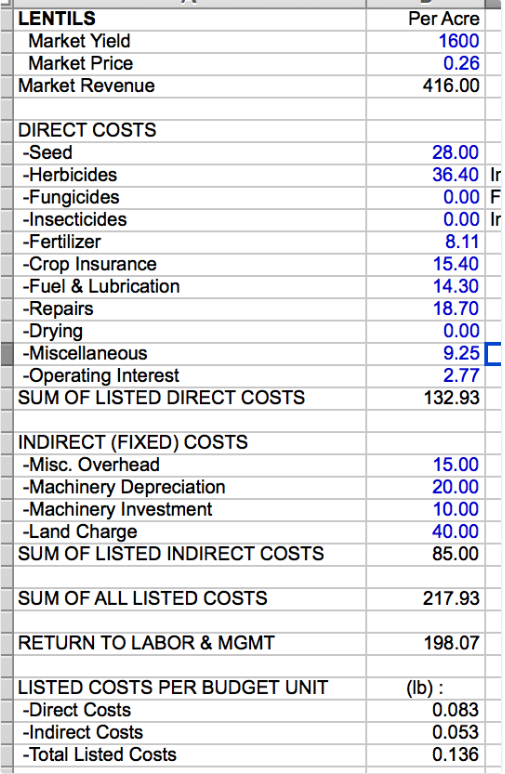 Here’s my estimated financials for this hypothetical producer’s 2015 lentil crop. Hint: look at the bottom line! Note that these costs come from NDSU with a little massaging from us but are likely light on overhead. 50% sold?!?!? Why not 100%?! A $400/acre profit is an astoundingly high profit for the northern plains. I asked a couple producers why the haven’t sold them all. Not surprising, their responses could be summed up with, “I shouldn’t have sold them damn things when they were $.30 so why should I sell now when they’re going to $.40+”. Even if you sold your first increment for $.25, you’d still be looking at a $300+ profit. They could very easily go to $.40 or more. No one knows. What I do know is that $400/acre profits in this part of the country NEED TO BE LOCKED IN. It’s a level of profit most farms see only once or twice in their farming careers (if they’re lucky). Sell them!! What happens if tomorrow that bid drops from $.39 to $.36? It’s human nature to lock up and lower your expected target to the recent high of $.39. Once a market like this starts lower, its highly likely that it continues to leak lower. During the fall of 2014, durum was selling for $16 and it’s now trading for $6.50. And there’s definitely some of that $16 durum still sitting in grain bins around the country (and likely a bit of $6+ corn, and $10+ spring wheat, etc). The next step is that we need to look at 2016 lentil profitability. New crop lentil prices are highly variable at the moment but there are 600 lb. contracts available for $.26/lb. Selling lentils for $.26 next year when they are $.39 this year?! Marketing is just one of many decisions a farm business needs to make. Most would like a crystal ball to tell them what lentil demand will do, when India will receive rain, exactly how many lentil acres will be planted year, and most of all what the high price of the year will be. That is impossible. Instead, let’s treat our marketing like a business and analyze 2016 profitability at today’s contract price. Here’s our profitability using a 1,600 lb. yield (-200 vs 2015) and a $.26 price. We need to take this analysis one step further. While its not our job to predict the future, it’s a safe assumption that lentil acres will be up dramatically in 2016. Lets assume our total production gets priced at the following prices. 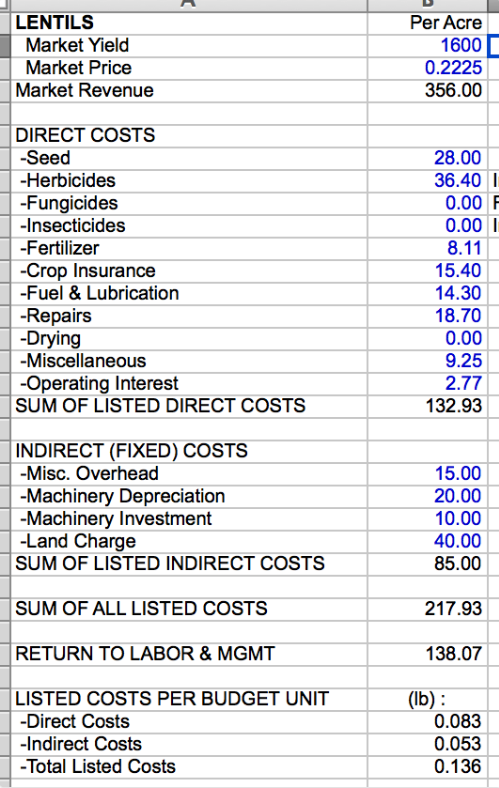 Here’s our profitability at an average price of $.2225. Even if prices decline below $.20 next year, the initial sale at $.26 provides good overall revenue protection. We could also spend some time analyzing producer’s greatest fear…..selling at $.26 and the market rallying to $.30+ again next year. Fear?? That would be the absolute best case scenario for a lentil producer. There are a few lessons that all producers can take from the current boom in lentil prices. Prices almost always move higher than anyone expects in bullish markets. Expect and plan for your sales to be way “too cheap” at times. Don’t let that stop you from making solid business decisions. Treat each crop year as a different business. You have to get comfortable selling into an inverted market. Just because 2016 prices are well below 2015 prices, it doesn’t mean you should remain “naked” on your 2016 production. Pay taxes, pay taxes, pay taxes. I know there are many factors to consider here and I’m not a tax professional but you need to use profitable years to build equity (often done via the addition of irrigation, drain tile, grain storage, or paying taxes!). As perverse as it sounds, your goal should be to pay as much in taxes as possible over your farming career. We’ll follow the next 12 months in the lentil market to see how it plays out. I hope prices stay strong and producers continue to make insane profits. Planning for dramatically increased acres and lower prices going forward is simply a smart risk management move in this environment. High prices cure high prices. Low prices cure low prices. If you enjoy content like this, please sign up for our email newsletter below. This is not a recommendation. This is only presented for informational purposes only. Do what is best for your farm.